The Blue Ridge Grotto is a social grotto, with politics taking a back seat to good trips, friendship, and good caving. We have monthly caving trips geared from the beginner to advanced project trips. We are not a large group, about 65 members, but we do have members from all over the state and the country. We are very active in the region (VAR) and the NSS. Most of the BRG Cave trips are for sport, although we do have members that are into project caving – work in surveying, exploration, photography, videography, cartography, science, and others. We have members involved in WVACS, VSS, VAR, WVCC, CCV, and a number of other 3 and 4 letter acronyms. So, whatever your interests are, there is a place for you in the Blue Ridge Grotto. Sec./Treas: Thomas G. Speers - NSS 10999. Dues of $1.50 a year were also voted on and passed. The program for the evening was a slide show of local cavers, Virginia Region Activities, and a recent NSS Convention by John Tichenor NSS 5670. This was followed up with a showing of Paxton's Cave, the next day's grotto trip by Albert W. Stewart. The meeting was adjourned to a party at the home of Marie and Gary Gray. Blue Ridge Grotto applied for NSS Internal Organization Status on January 10, 1970. The application was approved March 24, 1970, Bill Mixon welcomed BRG as an official internal organization of the NSS, and we became the Blue Ridge Grotto of the NSS, G-180. The first meeting of the Blue Ridge Grotto was called to order by Albert W. Stewart NSS 9695 at the Electrical Engineering Department of the Virginia Western Community College on December 12, 1969. In attendance were 15 to 20 people who voted the following persons into office unanimously Chairman Gary Gray 8415, Vice Chairman Joseph H. Fagan 10666, and Sec./Treas. Thomas G. Speers 10999. Dues of 1.50 a year were also voted on and passed. The program for the evening was a slide show of Local Cavers, Virginia Region Activities, and a recent NSS Convention by John Tichenor 5670. This as followed up with a showing of Paxton’s Cave the next day’s Grotto Cave Trip by Albert W. Stewart. Don Laffoon signed as a charter member on Dec. 12, 1969, but was not present at the January 10, 1970 meeting. John L. Sessoms, Thomas and Elizabeth Lamons failed to sign both copies of the NSS Application for IO Status. The Blue Ridge Grotto applied for membership in the NSS on January 10, 1970, and was approved as a chapter of the National Speleological Society, number G-180, on March 24, 1970. Bill Mixon sent the following letter. I welcome the Blue Ridge Grotto as an official internal organization of the NSS. Enclosed is your charter and one copy of your application. I am sending separately back issues of the Internal Organization Newsletter and the pages so far available of the new Internal Organizations Manual. Also in that envelope are forms for the 1969 annual report. Please fill out as much as it is appropriate for a new group and return to me. This must be done to obtain votes at the Congress of Grottos and your complimentary copies of the News and Bulletin. By January 1971, BRG had 33 members: 22 Regular members, and 10 Associate members. The Blue Ridge Grotto’s “CARBIDE DUMP” was first published in March, 1970. The co-editors of the Carbide Dump were David Warrington and Joey Fagan. The Carbide Dump was a quarterly publication. By October 1974 The Carbide Dump (still a quarterly publication) had Dave Wickersham as the new editor. Dave published a nice booklet, and served as editor for issues 0 – 12 (through October 1977). October 1974. Around this time BRG also acquired a large filing cabinet. Carol Wickersham, the grotto librarian, requested that anyone having materials belonging to the grotto to please turn them in so they may be placed on file for future reference. By January 1976, BRG had 28 members: John Balascio, Barb Balascio, Tom Beaman, Andy DeLeo, Joey Fagan, Joe Fagan, Sue Fagan, Barry Ferguson, Lynn Ferguson, Jerry Fink, Jim Dawson, Charles Maus, Janet Queisser, Gary Gray, Tom Hale, Gordon Hamilton, Rudy Jennings, Ben Johnson, Charlie Karpowich, Dot Lancaster, Leonard Rowe, Al Stewart, Bill Tanger, John Tichenor, Tommy Webb, Dave Wickersham, Carol Wickersham, Steve Winfrey. Other local cavers: John Robinson, Ron Salmons, Norm Soskel, Terry Verduin. Even then, there were closed caves, closed cave lists, cave owners fed up with inconsiderate trespassers, LOTS of environment and ecology issues, and boycotts of commercial caverns selling speleothems. Gating sacrificial caves vs. monitoring them and using a register to contact and educate “casual pseudo cavers” was another speleo-theme. Two “hot topics” in the old DUMPS were controversy over a “Super Rack” and the discovery and impending destruction of Holy Terror Cave. On May 16, 1976, Dave Wickersham and Bill Tanger sponsored the 1st Annual Blue Ridge Grotto Cave Rally. The event was held at Glenvar Railroad Cave, Roanoke Co., VA. (Glenvar Railroad has often been called “the ugliest cave in Roanoke County”; this was one of the reasons for its selection as a cave rally site.) The cave rally involved timing how long each caver took to go through the cave, visiting 13 checkpoints while carrying a raw egg. The egg had to be marked with a different colored marker at each checkpoint. If an egg was broken the contestant was allowed to return to the start and get a new egg because a broken egg meant disqualification at the finish. When he started again, however, his time kept right on going from his original starting time. Dave Wickersham reported that “Everyone finished the rally panting and dripping with sweat. Several threatened to smash their eggs on Bill and I. Lucky for us that a broken egg meant disqualification”. Results: Dave & Lucy Jamison won with 121 points, and Tom Beaman was disqualified since he was so familiar with the cave, although he did have the best point total. 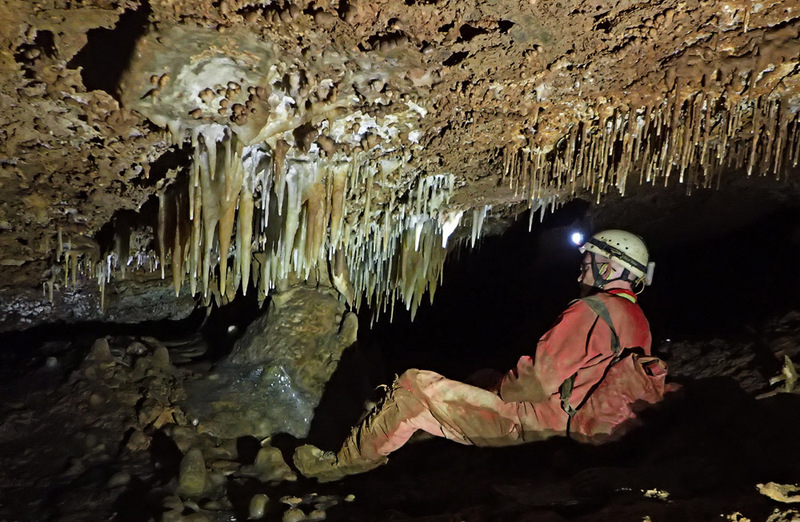 Many vertical caves were visited by BRG, and Dave Wickersham headed up the ROCKS project to map all the caves in Roanoke Co. What kind of pack to use, what type of camera worked best in a cave, and cave rescue call-down lists were other hot topics. Even decades ago BRG members volunteered to be a part of CRCN and NCRC (cave rescue organizations). Tom Beaman took over as editor of the Carbide Dump for issue 13-16 (combined), published in October 1978. The Carbide Dump, October 1979, combined issue 18-20, saw Jim Richards as the new editor. Jim continued as editor for issue 21 and issue 22, which appeared August 1980. The Carbide Dump went into hibernation after this issue. BRG had grown in ten years, having 40 members on its rolls. Bland Co.: Newberry-Banes, Buddy Penleys Cave, Repass Saltpeter Cave. Botetourt Co.: Bug Chaw Pit, Eagle Rock Quarry Cave, Henderson’s I & II Caves, Holy Terror Cave, Perry Saltpeter Cave. Pig Hole, Smith Pit, Tawney’s Cave, Smokehole, Starnes Cave. Rockingham Co.: 3-D Maze Cave, Lyle’s Pit, Mad Steer Cave. Greenbrier Co.: Bone-Norman Cave, Culverson Creek/Wildcat Cave, The Hole, McClung's Cave, Windy Mouth Cave. Pocahontas Co.: Cass Cave, Friars Hole, Steam Cave, Carpenter Swago, Roadside Pit, Tub Cave. Members of the Blue Ridge Grotto also kept in touch through a short monthly newspaper called the BLUE RIDGE GROTTO NEWS. Some are still on file. The 1983 (vol. 11) were edited by Linda Vest and Keith Goggin. By February 1984 there was enough interest to start up a new Carbide Dump. Keith Goggin was editor. There were 52 BRG members by February 1984. Dave Socky reincarnated the Carbide Dump, beginning with the Jan. 1985, Vol. 20 # 1 issue. Dave, with co-editor Mary Sue published the Carbide Dump 11 times a year. Dave Wickersham took over the Roanoke County Cve Survey in the hopes it would be compelted by the end of the decade, and a book on the Caves of Roanoke Co. would be published. A classy, royal blue T-shirt with the new BRG logo was designed by Chris Amundson (Alderson). Copyright 2018, Blue Ridge Grotto of the National Speleological Society.